The Chakras are an ideal roadmap for personal growth and development. In 2017 we started our journey through the Chakras and focused on one energy center a month. We are going to keep on going in 2018! On our monthly adventure, I am going to educate you about a specific Chakra or a Chakra concept and then ask you to contemplate its function and roll in your own personal growth. This month, we are going to focus on a technique to cleanse the chakras…a Fire Ceremony. A fire ceremony is a powerful practice used to release unwanted energies and attachments from the past and make space for new intentions. A fire ceremony can be used to release unhappy memories, fears, negative emotions, low vibrations, and anything that you are holding onto that doesn’t serve your Higher Self. By releasing these unwanted energies and old patterns into the fire, you are healing at the soul level. The fire ceremony is an ancient healing ceremony that is among the oldest still known to man today. All of life (including us as humans) is made up of light bound by matter energetically. During a fire ceremony, when you put something such as wood, stick, or paper into the fire, you are symbolically releasing matter back to its original essence which is a light. Fire transmutes the heavy energy into a light energy releasing it to the universe. 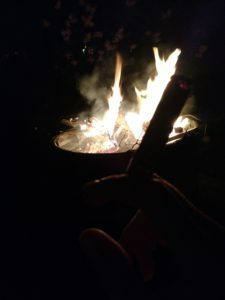 I like to do a fire ceremony during the change of seasons (solstices, equinoxes, Beltane, Samhain), at the Full Moon, New Moon, and I even bring in the New Year with a fire ceremony. A fire ceremony can be performed any time you are feeling stuck, creating something new, or need to shift the energy. 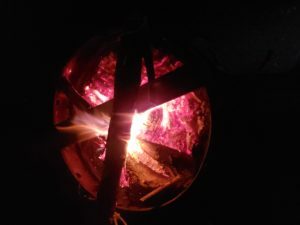 October 2018 Chakra Contemplation and Suggestions: Since the Chakras guide every area of our lives, I like to structure my fire ceremony around the chakras. Utilize the guide below to assist you in taking an inventory of your chakras and your life. Identify what you are holding onto and what you are carrying around that is holding you back from reaching your full potential. Then let go of it….release it to the universe to be transformed. 1) Connect with your heart and ask, “What do I need to release in each one of my chakras, that doesn’t serve me anymore?” You can utilize the prompts that I created below. 2) You can draw and/or write intentions that you want to release. Some people prefer to draw or make art for what they are releasing. I like to do a combination of both. 3). Take some time to draw or write down things that are holding you back that you want to release on a piece of paper. You will burn this in your fire ceremony. 4). Find a stick to add to your fire. Before coming to the fire circle, create an offering out of burnable materials, typically a small stick. This “spirit arrow” can represent an issue or something that needs to be honored in order for you to let go of it. The offering serves to focus one’s attention in active meditation. Chakra Fire Ceremony- Write the following on a piece of paper and burn when done.